...include power uncoiling for tougher, thicker material; flexibility to handle higher- and lower-gauge product; and more. We know about precise control of slide motion throughout the stroke...but here's what it means for part quality and tool life. Cutting heads with automated adjustments, intuitive user interfaces and advanced systems for newcomers are just some of the recent innovations. 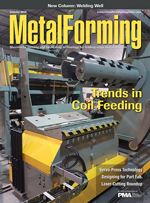 ...occurs on the broad shoulders of new sheetmetal-fabrication CAD-CAM software, driving productivity gains when it comes to sheetmetal nesting and programming of laser-cutting machines, press brakes and turret-press punching operations. Follow these tips to improve productivity and minimize, or eliminate, costly and wasteful engineering change orders.